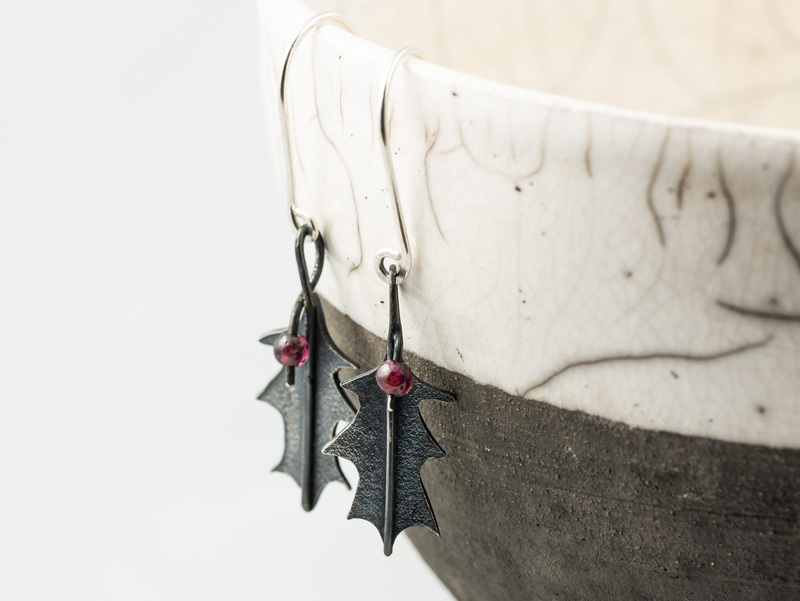 I’m still hard at work on some wintry designs, and I’ve just finished these lovely little holly leaf earrings. They’re cut from lightly textured silver sheet, then oxidised until they turn a dark slate grey colour. I’ve chosen to give them a light polish, retaining most of the oxidisation, as I thought it captured the dark, glossy surface of holly leaves better than bright silver. The berries are tiny garnet beads. Holly has long been associated with Christmas and the winter solstice. It is a tree of hope, and a reminder of the springtime to come. Garnets are the birthstone for the month of January. They are associated with love, and are said to protect travellers. You can find these festive earrings in my online shop now.